Do you use virgin coconut oil? It’s quite the workhorse in terms of culinary and nutritional value. As a saturated fat it’s solid at room temperature but melts when heated. This means it’s a very stable fat which can be heated to high temperatures without forming free radicals. It’s a great vegan choice for sautéing, baking, and roasting. The saturated fat in coconut oil is nothing to worry about as it’s a medium chain fatty acid (MCFA) as opposed to the long chain saturated fats of poor quality fats (often found in commercially processed foods) which are linked with inflammation and heart disease. MCFAs are quickly absorbed by the body and used as energy whereas poor quality saturated fats hang around for awhile prompting the body to store them as fat and accept the toxins they introduce. Virgin coconut oil is also a great source of lauric acid. This is a fat with strong antiviral and antimicrobial properties which is also found in breast milk. While coconut oil isn’t a source of Omega 3 fatty acids, it does aid the body in efficiently absorbing this type of fat from other sources. Still nervous about exalting a saturated fat? Consider all the traditional cultures of the tropics who have been making and using coconut oil for hundreds of years with very few incidences of heart disease. This isn’t a fad food of the health world but one which has earned its reputation through the traditional diets of several cultures. Why virgin? Any coconut oil not labeled “virgin” has been refined into a cheaper oil. The refinement process highly compromises the healthful properties of virgin coconut oil through the use of industrial machinery and chemicals which destroy its high levels of antioxidants and produce free radicals. Not to mention anything other than virgin coconut oil lacks that gorgeous coconutty smell. 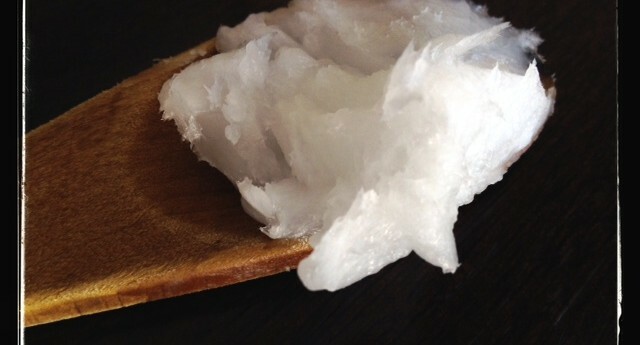 In a perfect world, we could all get our hands on “fair-trade wet-milled virgin coconut oil”. These terms ensure the oil is being made according to traditional methods and the people producing it are receiving fair wages for their work. Until “wet-milled” processing becomes widely available, look for the terms “virgin” and “fair-trade”. The term“cold-pressed” thrown in there somewhere is also indicative of high quality oil. My use of coconut oil doesn’t stop in the kitchen. With just a few other pantry ingredients, it makes a great homemade deodorant.